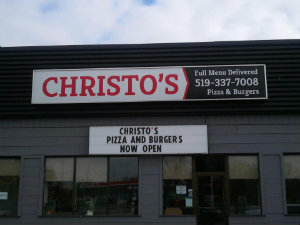 Fast and affordable is one way to describe Christo’s Pizza & Burgers but that isn’t the entire story. We’ve become known for using only the freshest ingredients and cooking your meal to order, just the way you want it. Our management and staff also believe in giving back to the community that has made us a success. We actively support local youth teams and take part in fundraising for Multiple Sclerosis.